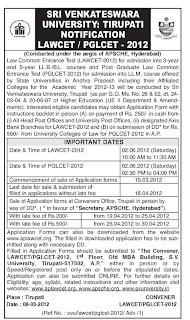 Sri Venkateswara University, Tirupati on behalf of APSCHE is going to conduct Law Common Entrance Test (LAWCET-2012) for admission into 3-year and 5-year LL.B/B.L. courses and Post Graduate Law Common Entrance Test (PGLCET-2012) for admission into LL.M. course offered by State Universities in A.P. including their affiliated colleges for the Academic Year 2012-2013. 3 - year LL.B/B.L : Candidates should have appeared or passed any Graduation (10+2+3 pattern) of a recognized University with 45% of aggregate marks or any other examination recognized as equivalent by the Universities concerned. 5 - year LL.B/B.L : Candidates should have appeared or passed 2 - year Intermediate Examination (10+2 pattern) with 45% of aggregate marks for any other examination recognized as equivalent by the University concerned or the Board of Intermediate Education, A.P. LL.M : Candidate holding LL.B./B.L. Degree and candidates who have appeared/appearing for LL.B/B.L., final year examination. Age limit is not prescribed for admission into LL.M course. 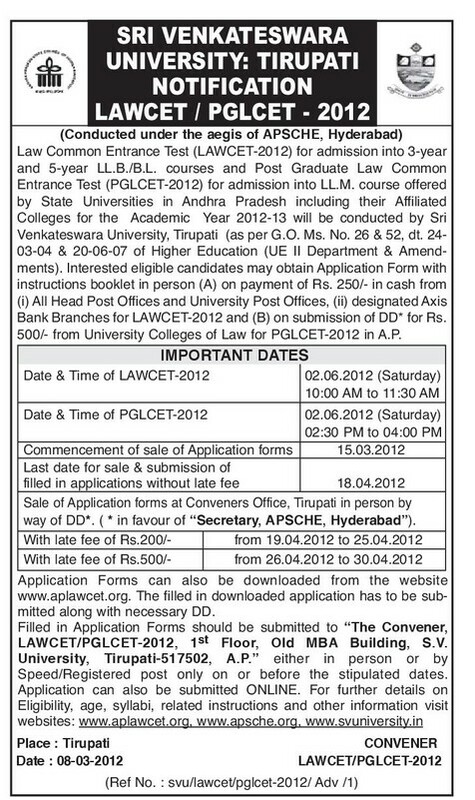 (B) On submission of DD for Rs.500/- from University Colleges of Law for PGLCET-2012 in A.P. Application forms can also be downloaded from the website: www.aplawcet.org . The filled in application has to be submitted along with necessary DD. Filled in application forms should be submitted to the “The Convener, LAWCET/PGLCET-2012, 1st floor, Old MBA Building, S.V. University, Tirupati-517502, A.P.” either in person or by Speed/Registered post only on or before the stipulated dates. Application forms can also be submitted online.